With Apple rumored to be switching to OLED screens starting with the 2017 iPhone, research firm IHS believes that product's launch will serve as a game changer for OLED technology and mobile displays. "iPhone 7" concept via Martin Hajek. While AMOLED displays are currently less common than competing LTPS LCD and a-Si technology, IHS Markit believes that will change by 2020, at which point it predicts OLED will be the most common smartphone display. Last year, OLED panels represented less than 20 percent of the overall market. 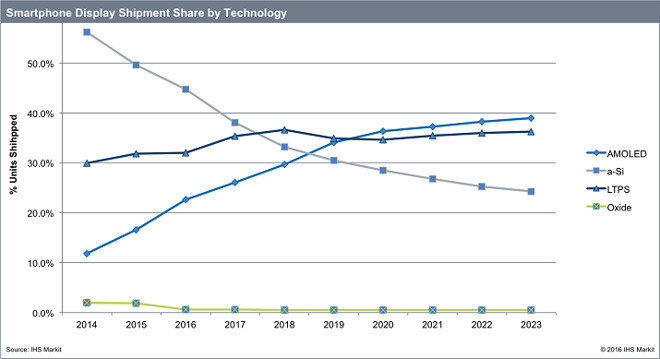 But by 2020, IHS believes OLED will be found in nearly 40 percent of smartphones sold. A major factor in that trend is predicted to be Apple: The company is rumored to be working on a major redesign for its iPhone next year, featuring an OLED display with components like the speaker and FaceTime camera hidden behind it. Apple's expected entrance into the OLED market is already having a major effect on display manufacturers, who are investing in the technology and ramping up production in apparent bids to win business for the future iPhone. IHS, too, cited Apple in its predictions, noting that "all signs" point to future iPhones boasting OLED displays. Apple currently uses OLED in one product, the Apple Watch. "Apple's upcoming adoption of OLED displays will be a milestone for OLED in the display industry," said David Hsieh, senior director at IHS. To date, all iPhones have featured LCD panels, due to the technology's supply flexibility, longer product life, and superior visibility in sunlight. With OLED technology, each individual pixel is self-lit, which means "black" (unused) pixels do not require as much power as illuminated pixels. OLED panels can also be flexible, allowing for new form factors like curved screens. 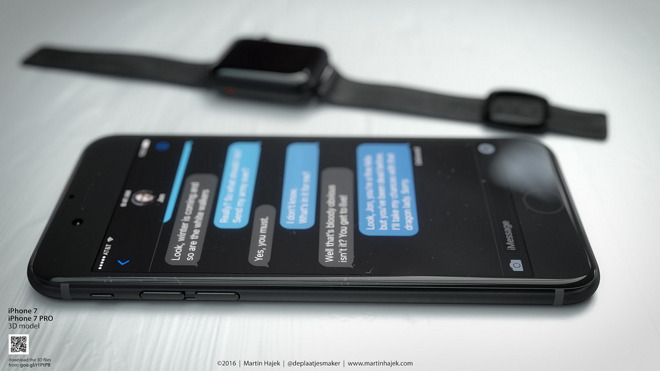 The OLED screen in the Apple Watch is paired with a dark user interface, playing a key role in giving the wearable device a full day of battery life. In Apple's upcoming iOS 10 release, there has been evidence of a secret "dark mode", suggesting that Apple could be working on a new interface for a future OLED iPhone.